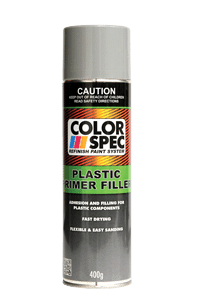 ColorSpec plastic primer filler is specifically designed for bumper bars, automotive vehicles and most household plastic parts. It is a fast drying flexible primer, easy to sand and provides excellent adhesion to most plastic surfaces for repairs and minor surface imperfections. ColorSpec Plastic Primer Filler can be top coated with Colorspec base coat, clear coat system and most conventional single pack colour coats, including acrylic and automotive topcoats.